One of the staples of canon Traveller is the Imperial X-Boat (Express Boat) network. This uses Jump 4 X-Boats to carry data and communications from system to system, much like the old Pony Express from Terra. In fact the the symbol of the Express Boat Service is a rider on a galloping steed (which due to a misinterpretation of old Anglic was translated as “poni” – a beast of burden on several worlds in the old Sylean Federation – the mistake was discovered but the emblem stayed in use). The Express Boat is a small teardrop shaped 100-Dton jump ship. It has performance of Jump4 but carries no maneuver drives other than attitude thrusters – it is reliant on X-Boat Tenders for refueling, resupply and crew change over. The crew is normally one, although there are two staterooms. 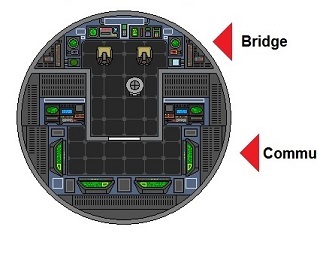 The ship has extensive computers and storage banks for vast amounts of data. 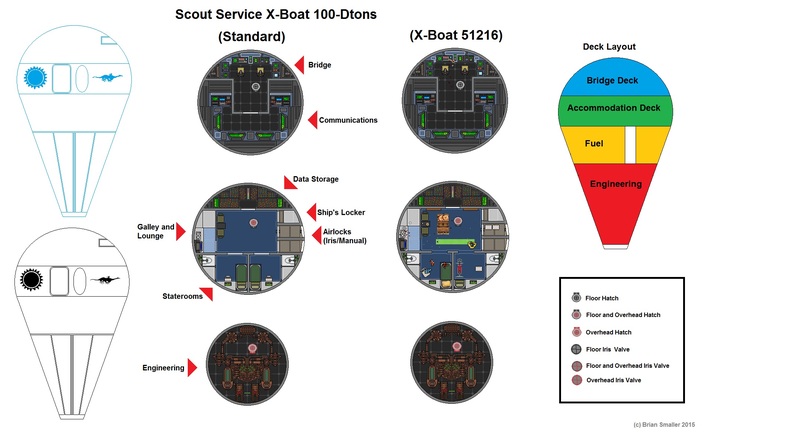 The boats sit on station in a system and when another X-Boat jumps in-system, it transmits it’s stored data to the waiting ship that then jumps to it’s next destination. X-Boat pilots log a lot of Jumps, but spend a lot of time alone. In Jump Space – with nobody to talk to. Interior Detail of the bridge and communications room. Here are my plans for the Classic Traveller X-Boat #51216 from Supplement 7: Traders and Gunboats (pages 8-11) and a brief file note on the current main pilot of this particular ship. Skills: Pilot(Spacecraft) 2, Comms 2, Astrogation 1, Jack of Trades 1, Engineering 1, Navigation 0, Streetwise 0, Computer 1, Fly (Grav Vehicle) 0, Carouse 1, Investigate 1, Athletics (Golf) 0. Story: Dave is your typical X-Boat pilot. Happy with his own company and enjoys the freedom to be himself. He has had a fairly mundane career so far with no real problems coming his way. He is however, a bit of a slob, and the X-Boat Tender cleaning crew are forever complaining about the state of his ship when it comes in for servicing. The cleaning chief has reminded him many times that regs do not allow consumption of food at the comms or pilot stations. Like most X-Boat pilots Dave wiles away the long days in Jump Space on hobbies. He reads, watches old Tri-V shows and has recently taken up golf. Apparently his putting is getting better but he needs a lot of work on his long game. Sim-software just not the same as a real game.